EUR/GBP- The pair faces further downside pressure leaving risk lower. Support lies at the 0.8650 level where a violation will turn focus to the 0.8600 level. A break will expose the 0.8550 level. Its daily RSI is bearish and pointing lower suggesting further weakness. Conversely, resistance resides at the 0.8800 level where a violation if seen will turn risk towards the 0.8850 level. 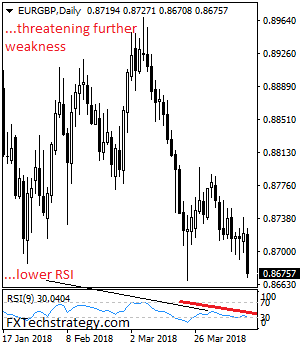 Further up, resistance resides at 0.8900 level followed by the 0.8950 level. All in all, EUR/GBP remains biased to the downside on more weakness.